Next, the body protector. Hoovy was delighted to find a black one in her size as her old one was navy blue and didn’t match her black boots and hat. Now just because riding can be mucky does NOT mean you have to be a fashion disaster! 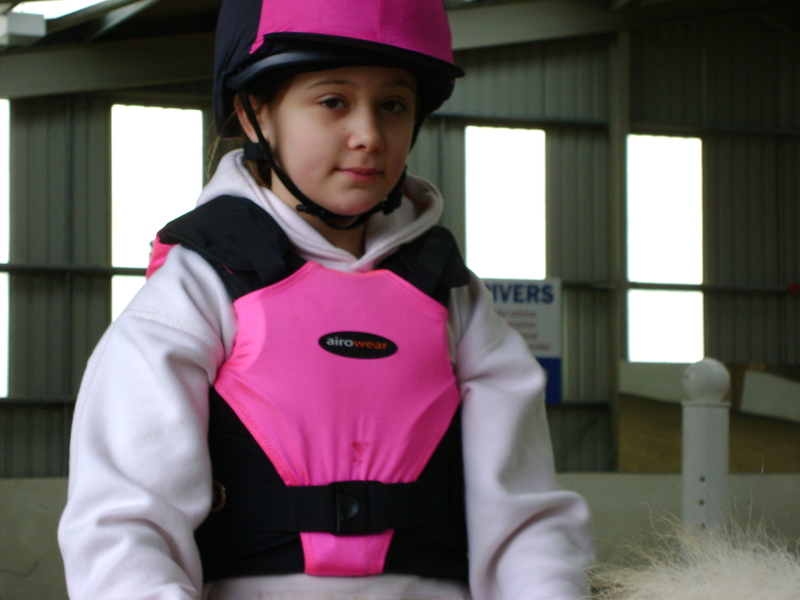 So brand new black body protector which when worn with the hot pink covers she already had alongside the new hat with it’s black and hot pink silk = one totally colour co-ordinated rider! And here is the pic to prove it! Oh yes and don’t forget the black gloves (which sadly cannot be seen in this snap). 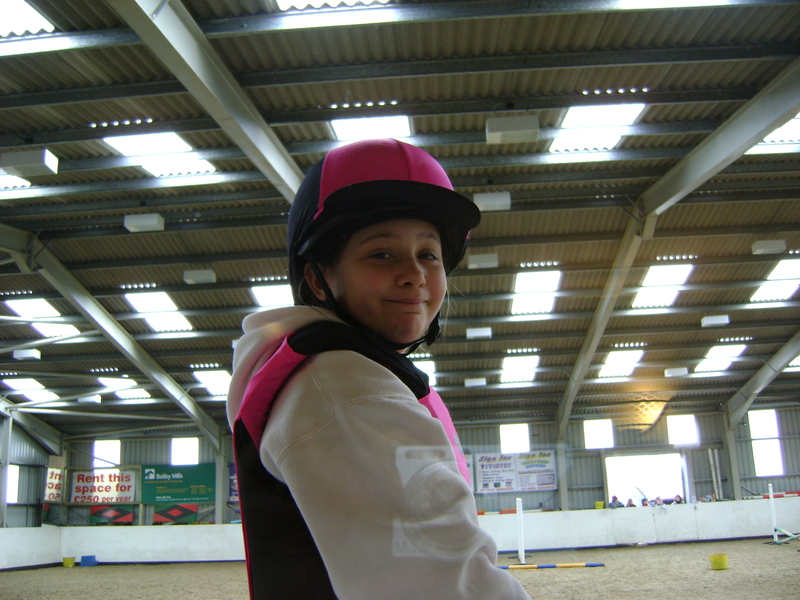 Now she (naturally) already had pink jodhpurs and various pink tops to wear along with the rest of her kit. Another thing you cannot see here is the Tshirt she has on underneath. This was a present for Valentine’s day and she absolutely loves that her sister Crystal embellished it for her. The t-shirt already had horsey hoof prints and what-not on it but Crystal lovingly added “I love Horses” to it. This little personal touch really makes it very special for Hoovy (she LOVES her big sister!). One final thing to mention … in this photo (taken today) she is wearing my pink university hoodie. 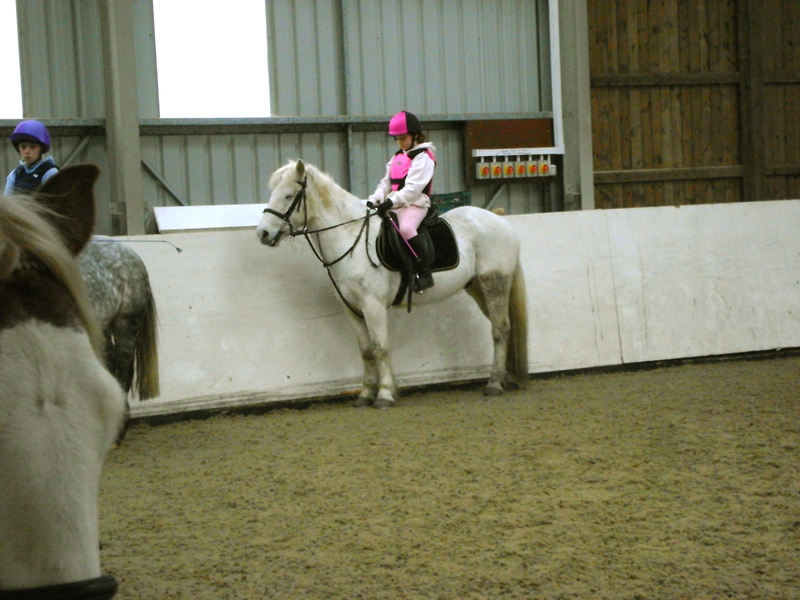 This is only significant because when she came off a horse called Molly just before xmas, she was wearing her own pink uni hoodie that was exactly like mine (only 1 size smaller). Sadly, hers had to be cut off and I am surprised she even considered wearing mine as she did not like hers being cut. Who knows she might feel more secure in mine? SO … all decked out and ready to ride! 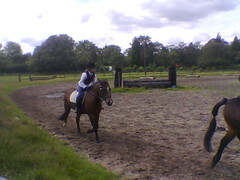 As mentioned today was her 3rd lesson since her return. Hope you enjoyed the show!!!! Comments are MOST welcomed!!!! Well this week’s biggest news has to be Hoovy’s competition day at the end of her riding holiday. She looked after Bold all week long and they certainly developed a great bond. They looked good riding around for their warm-up shown in this photo captured on a mobile phone. The real surprise was when they began their round. I have never ever seen her ride so beautifully. Unfortunately they had a hiccup so only managed 4th place but her posture, confidence, fluidity and focus was amazing to watch. Later in the showjumping round, they had another hiccup as Bold seemed determined to return to his fellow horse friends before he’d finished but again they rode so smoothly. I even heard other parents commenting on her style and how beautifully she sat. This has lead us to begin discussions on where to go with her next. Her local stable is no longer what she needs to continue to develop her skills. We know there are many routes she could take but have to discuss it further amongst ourselves, with her and her instructors before making a decision. This is a little girl who at the age of 3 first sat on on a horse and wanted the adults to let go of the reins and that she wanted to jump! And she was being very serious at the time. Over the past 6 years we have had the pleasure of watching her grow as a rider and her determination to be a very competitive rider is still there. As parents we always had a niggling concern that she would ‘go off’ horses but we are now convinced that she is one of the lucky people who know exactly what they want to do in life at a very early age.